I am quite intrigued by this movie, which I have not yet had a chance to see. Greatly hope it is as good as the rather reliable reviewers at Inconsistent Pacing make out. Do you remember the first time you watched Jaws, and you were really hyped up, but it was kind of disappointing? And you complained about the corny acting and the special effects and someone said, hey, you’ve missed the point? And then you watched it again, and this time you got it, because you knew the secret: Jaws is not a film about sharks. Jaws is a film about fear. That magical moment has never happened for me. I think Jaws is a terrible, boring film, and I always will. But I mention it now because The Death of Stalin is not about Stalin. Or sharks. By Robert Pimm in Robert Pimm on 08/04/2018 . Well I enjoyed it. It was longer than I usually like, at around 100 mins, but didn’t outstay its welcome and there were some truly excellent performances. 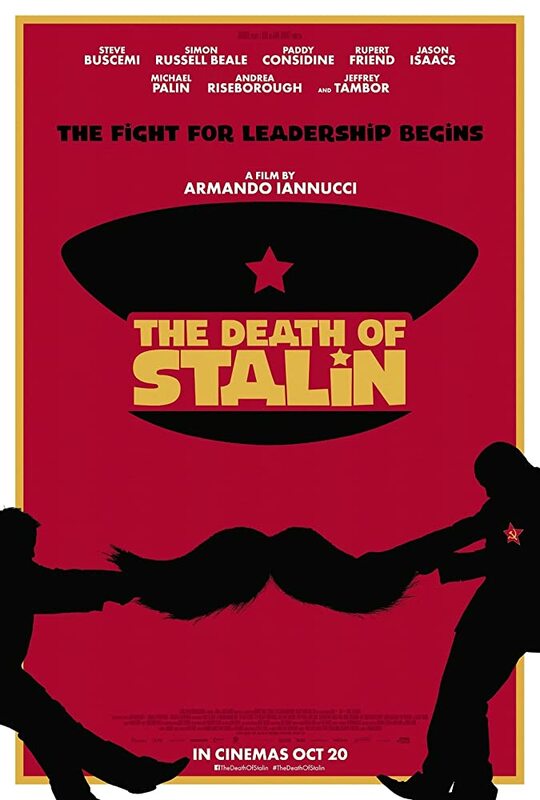 I decided it wasn’t really a comedy as such; rather it used comic devices to portray the banality and brutality of the Stalin regime. Most of the people around him came across as utter mediocrities, which they probably were – the exception being Marshal Zhukov. Not many parts for women, but the two chief female characters – Stalin’s daughter and a brave pianist – were both outstanding. I thought Beria got off far too lightly, though, until he was finally dispensed with. The main weakness was that some of the violence was too cartoonish and overt – one of the horrors of Stalinism was that so much happened in secret. There were some telling comments from “senior Russian cultural figures” quoted in the Times describing TDoS as “insulting” and “disgusting” and “vicious and absolutely inappropriate”. Clearly a nerve was struck there. Nachdem ich die sehr ausführliche Vorschau gesehen habe, beschloss ich, mir den Film nicht zur Gänze anzuschauen: der überzeichnete Humor in dem diese sinsistren Gestalten forgeführt wurden, werden diesen Verbrechern, allen voran Beria nicht gerecht und ob die beiden Frauen tatsächlich solche Lichtgestalten waren, kann ich nicht beurteilen.